At Guitar World, for Black Friday and Cyber Monday and throughout the Holiday season, we'll be bringing you the best deals on guitar gear of all kinds. If you're thinking of picking up an ESP LTD BK-600 Bill Kelliher model, Walmart's probably not the first destination that'd pop into your mind. 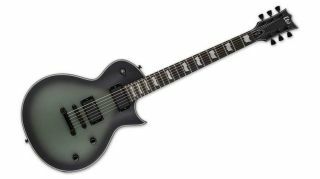 However, for Black Friday, the retail behemoth is offering a phenomenal discount on the Mastodon signature guitar. Walmart has taken $389 off the price of the souped-up single-cut, bringing the grand total to $649, down from $1,039. The guitar features Kelliher's Lace Sensor Dissonant Aggressor pickups, a mahogany body and neck, ebony fingerboard and TonePros locking TOM bridge and tailpiece. The deal also includes a ChromaCast Pro Series hardcase, med-light gauge max sustain guitar strings, a 4 pick sampler, nylon strap, 10' pro series instrument cable and tuner.